Learn how a variety of our controlled-release and slow-release fertilizers provide nutrients to turfgrass over time. The below graph denotes typical nutrient release for 100% DURATION CR 45 fertilizer technology. The solid blue line indicates nutrient release as a percentage of the total amount and corresponds to the left-side axis. The shaded area represents corresponding release in lbs nitrogen (N) per 1000 ft2, based on application at a recommended rate of 0.7-1.2 lb N/1000 ft2, and is related to the right-side axis. Test Method: Refractive index variation with dissolved fertilizer salt concentration is used to measure the percent release measurements up to 80% release. Release curve is generated by placing a measured weight of DURATION CR 45 fertilizer into a known volume of water. Water is maintained at a constant temperature and the release of nutrient into the water is measured every seven days. Data is plotted to create the typical release curve. The below graph denotes typical nutrient release for 100% DURATION CR 90 fertilizer technology. The solid blue line indicates nutrient release as a percentage of the total amount and corresponds to the left-side axis. The shaded area represents corresponding release in lbs nitrogen (N) per 1000 ft2, based on application at a recommended rate of 1.2-1.6 lb N/1000 ft2, and is related to the right-side axis. 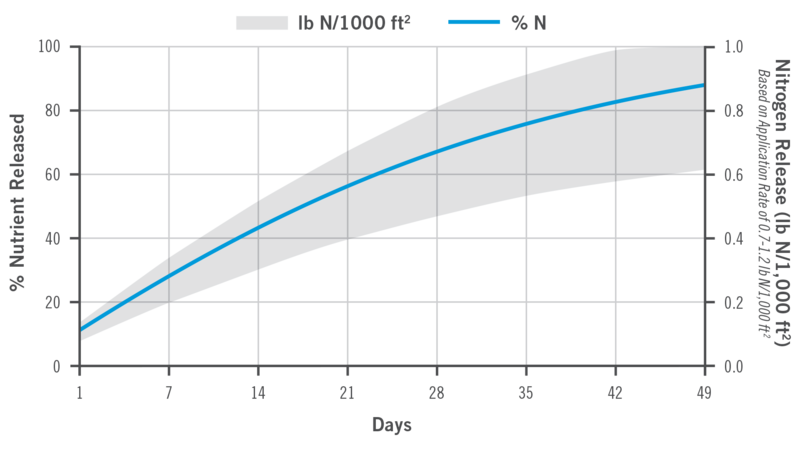 Release curve is generated by placing a measured weight of DURATION CR 90 fertilizer into a known volume of water. Water is maintained at a constant temperature and the release of nutrient into the water is measured every seven days. Data is plotted to create the typical release curve. The below graph denotes typical nutrient release for 100% DURATION CR 120 fertilizer technology. 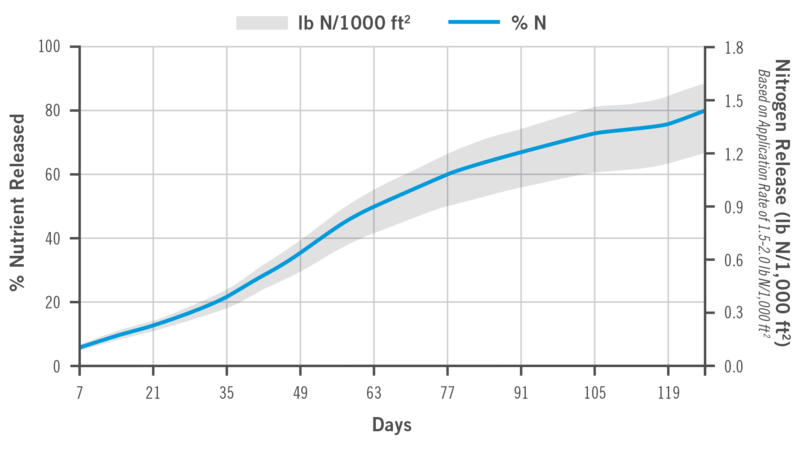 The solid blue line indicates nutrient release as a percentage of the total amount and corresponds to the left-side axis. 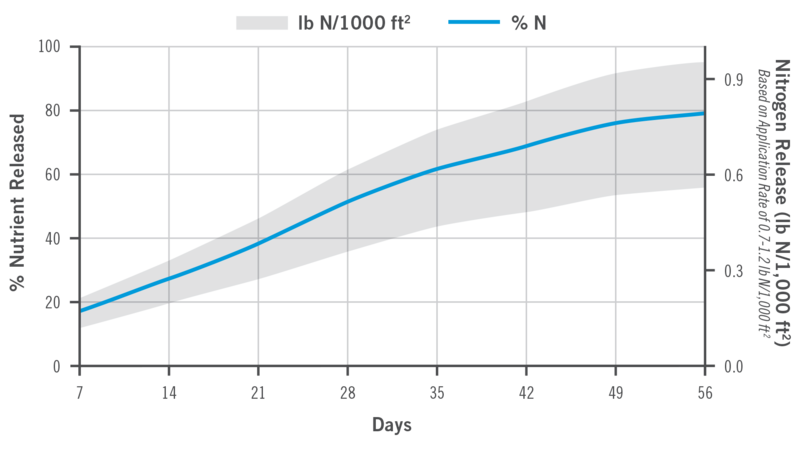 The shaded area represents corresponding release in lbs nitrogen (N) per 1000 ft2, based on application at a recommended rate of 1.5-2.0 lb N/1000 ft2, and is related to the right-side axis. 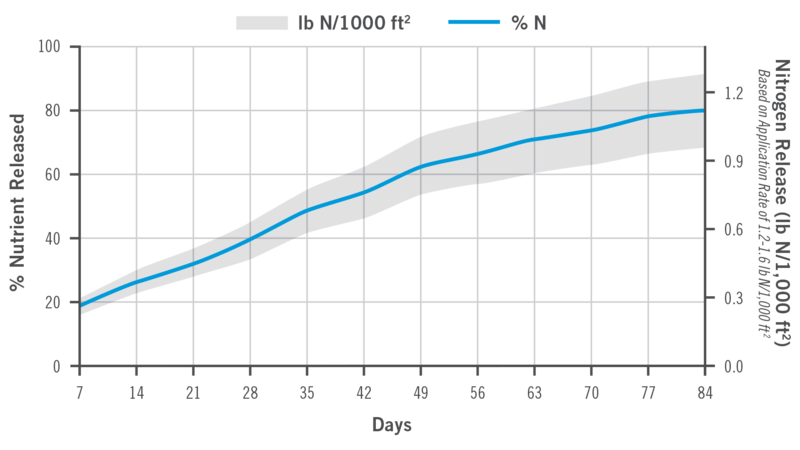 The below graph denotes typical nutrient release for 100% DURATION CR 180 fertilizer technology. The solid blue line indicates nutrient release as a percentage of the total amount and corresponds to the left-side axis. The shaded area represents corresponding release in lbs nitrogen (N) per 1000 ft2, based on application at a recommended rate of 2.3-3.1 lb N/1000 ft2, and is related to the right-side axis. 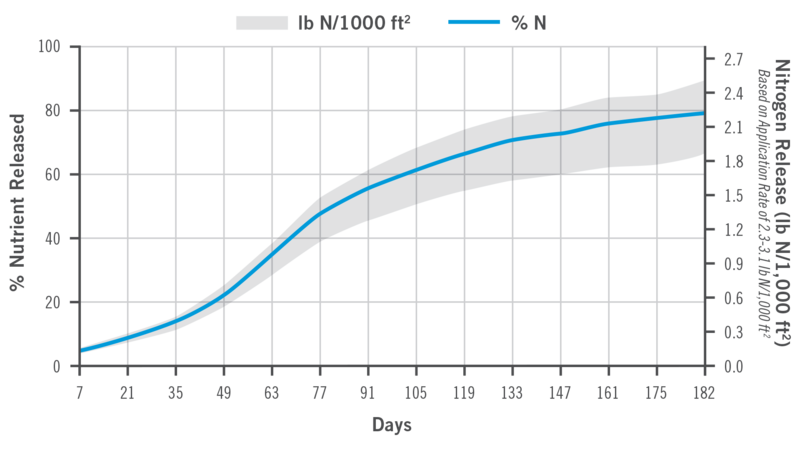 Release curve is generated by placing a measured weight of DURATION CR 180 fertilizer into a known volume of water. Water is maintained at a constant temperature and the release of nutrient into the water is measured every seven days. Data is plotted to create the typical release curve. The below graph denotes typical nutrient release for 100% XCU fertilizer technology. The solid blue line indicates nutrient release as a percentage of the total amount and corresponds to the left-side axis. The shaded area represents corresponding release in lbs nitrogen (N) per 1000 ft2, based on application at a recommended rate of 0.7-1.2 lb N/1000 ft2, and is related to the right-side axis. Release curve is generated by placing a measured weight of XCU fertilizer into a known volume of water. Water is maintained at a constant temperature and the release of nutrient into the water is measured every seven days. Data is plotted to create the typical release curve. This is a typical release data report for the product and is not specific to any particular batch or lot. Koch Agronomic Services does not represent or warrant the accuracy of this data for any particular batch or lot. Release in water can be significantly different from release in soil medium. Environmental conditions such as weather patterns and soil conditions vary from location to location and may affect the performance of the product. This data is for informational purposes only and should not be interpreted as a recommendation. This information should only be interpreted in consultation with a Koch Agronomic Services agronomist.